If I'm using something a bazillion times in the same function, I'll consider a typedef, but usually it's not necessary. Fully qualified names. Period. Being able to clearly see at the first glance what you are dealing with is more important than brevity (at least in C++). btw. we probably should remove the section about using declarations at some point. That was a nod towards people who preferred this feature, done at a time when the source code was less mature. But since basically nobody makes use of it in OpenMW, there is little point in keeping this section of the style guide around. Regarding authors recommending shortening code in any way possible: Well, there is a lot of bad advice around C++ on the internet. I have installed 7-Zip with a system path variable "E:\Program Files\7-Zip"
I have installed CMake with a system path variable "E:\Program Files\CMake\bin"
I have cloned openmw from GitHub into "E:\Source\openmw"
Running prebuild outside of Appveyor. Please download the latest and try again please. Although problem seems to be solved by clicking ignore. 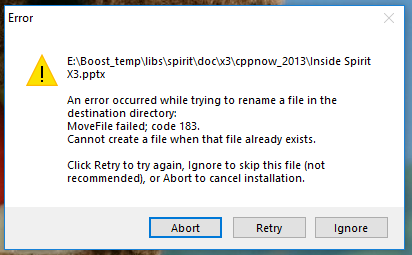 I'm not sure if the file actually already exists, or the code attempts to copy over twice? I might be misunderstanding this last post, but if you're still having this problem, by pure coincidence I tried to build this for the first time a few days ago as well and hit the same problem. For the Win64 version it failed to find the boost libraries completely but with the Win32 it worked fine as long as I extracted things manually. Just add -e (skip extraction), extract/install things manually and follow the errors to pinpoint the folder structures. You'll have to rename a lot of folders and move things around a bit, but it works flawlessly. I wasn't sure to make any posts of this as it seemed like the kind of bug that'd be fixed really quickly. Haven't tried it yet with the updated script, though. Give it a spin to see if it still fails on x64 and/or still runs on x32? Although I didn't try redownloading the dependencies for Win32, everything was extracted and moved/renamed properly. Win64 is working correctly, the only problem I had was regarding permissions to move the OSG folder specifically, but renaming it manually to OSG revealed no further problems on my end. I assume it was just me doing something bad, so the script is working properly now! Thanks a lot!